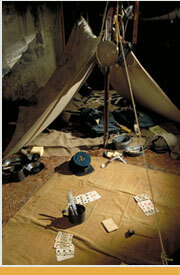 Life in camp was very different for officers and enlisted men. Officers were usually allowed more comforts and freedoms. Privates and non-commissioned officers led a more Spartan life. Officers in the field lived better than enlisted men. They slept one or two officers to a tent. Since the officers provided their own personal gear, items varied greatly and reflected individual taste. Each junior officer was allowed one trunk of personal belongings that was carried in a baggage wagon. Higher-ranking officers were allowed more baggage. 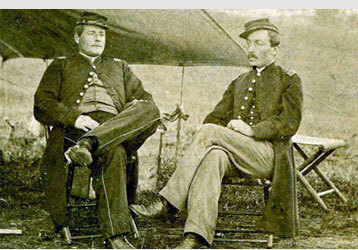 Unlike infantrymen, who slept and sat on whatever nature provided, officers sometimes had the luxury of furniture. Enlisted men, unlike their officers, carried all their belongings on their back. On long marches, men were unwilling to carry more than the absolute essentials. Even so, soldiers ended up carrying about thirty to forty pounds. Each soldier was issued half of a tent. 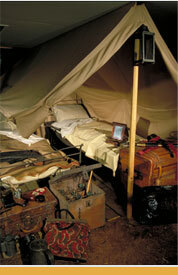 It was designed to join with another soldier's half to make a full size tent. The odd man lost out. The shelter halves were so useful that they were used after the war. As a result, very few remain today. When suitable wooden poles were not available for tent supports, soldiers would sometimes use their weapons.